This is what we worked on in Robotics class. 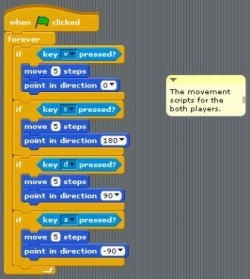 We learned how to do programming scripts and basic commands in tutorials, then we where assigned to make a game of our own. This is the product of my script commands in Robotics class. Left : The basic commands for walking for the players. Bottom: The commands for variables to respawn the enemies.